In Britain, Steel Framing Systems (SFS) make up a substantial part of the offsite solutions portfolio – from structural panels to complete frames, plus a variety of roofing, volumetric modular options and infill walling applications. 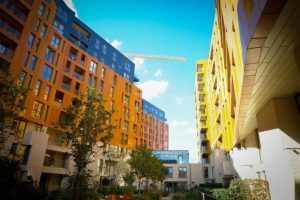 Steve Thompson, Managing Director of EOS Facades, shares his perspective how the industry can meet the specified target of 300,000 homes per year by 2025 – and cold-formed steel framing is at the forefront of the solution. Thompson notes that advancements in CAD/CAM systems (that control manufacturing machinery to produce the light gauge steel sections) are required to optimize the frame or cassette design. By manufacturing offsite for onsite installation – contractors are able to create much of the finished product in the factory – ultimately minimizing onsite labor. Thompson concludes that there has never been a better time to capitalize on the raft of benefits that factory-based steel solutions deliver. As an advanced high performance offsite solution, SFS (using cold-formed steel) are perfectly positioned to meet housing industry demands – they are future proof and future ready.